The Spotlight Lecture Series was held on April 13th and featured Nathaniel Kendall-Taylor, Vice President for Research at FrameWorks Institute. Dr. Kendall-Taylor is a medical anthropologist leading a multi-disciplinary team of social scientists in studying public understanding and exploring ways to reframe such pressing issues as criminal justice reform, immigration, taxation, early childhood development, addiction, environmental health, education, public health and climate change. He employs social science theory and research methods from anthropology to improve the ability of researchers, advocates and practitioners to improve social outcome. His past research has focused on child and family health and in understanding the social and cultural factors that create health disparities and affect decision-making. He has conducted fieldwork studying pediatric epilepsy and the impacts of chronic illness on family well-being on the coast of Kenya. He has applied social science methods in research on child marriage in Azerbaijan and higher education in Kazakhstan, and he has conducted ethnographic research on theories of motivation in “extreme” athletes. Dr. Kendall-Taylor’s lecture, titled “Framing for Change: A Cultural-Cognitive Approach to Communication,” was made possible through the generous support of Mr. Jonathan Plimpton, Managing Director, International Business Management, Inc. and a 1970 graduate of Anthropology at Western Reserve College. Congratulations to the following faculty for being nominated for the awards below. Drs. Vanessa Hildebrand and Janet McGrath were nominated for the Carl F. Wittke Award for Excellence in Undergraduate Teaching. This award is presented annually to two faculty members who have demonstrated excellence in undergraduate teaching. Dr. Cynthia Beall was nominated for the J. Bruce Jackson, MD, Award for Excellence in Undergraduate Mentoring. This award recognizes the positive impact Case Western Reserve University faculty and staff have on the lives of students. Dr. Vanessa Hildebrand was also nominated for the John S. Diekhoff Award for Graduate Mentoring. This award is presented to four full-time faculty members who make exemplary contributions to the education and development of graduate students at Case Western Reserve University. Two awards are given for outstanding mentors and two for those who excel in the teaching of graduate students. The Department celebrated National Anthropology Day on February 26 with pizza, raffle prizes, popcorn and featured documentary “The Hunters” by John Marshall. Congratulations to Yunzhu Chen, Francis Manzella, Anna Pickard, and Carolyn Smith, winners of the raffle prizes. Faculty, graduate students, and alumni came together at the 2014 American Anthropological Association (AAA) Annual Meeting held in Washington, DC this past December. There was a tremendous turnout from chairing and organizing roundtable panels to presenting and discussing. Dr. Lihong Shi presented “China’s New Rich and Their Out-of-Plan Births: Stratified Reproduction and the Reproduction of Social Polarization. 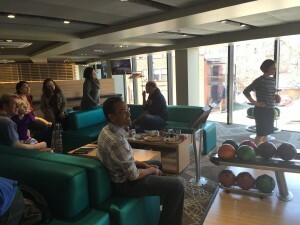 celebrating with faculty and graduate students with games of bowling and appetizers. In “Illegal Drugs and Society” (ANTH 335/435), taught by Dr. Lee Hoffer, students collaborate on scientific posters for their final class project. 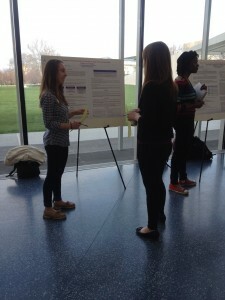 The posters originate from class readings, lectures, and discussions covering a broad range of topics that allow students an opportunity to explore their personal interests in more detail. Dr. Hoffer would like to congratulate Samantha Marek, Shruthi Srinivas, and Phil Yoo for their winning poster entitled “Drug Users are a Stigmatized Population in The Emergency Department.” (image below). The winning poster will be displayed in the anthropology department and all are welcome to come by to see it. Katia also organized and moderated a panel on “Body Cultures in Latin America: Anthropological Perspectives” this past February. 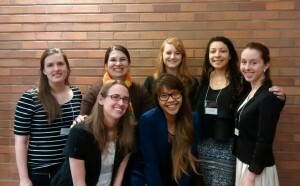 This panel was part of the 14th Ohio Latin American Conference (OLAC) that took place at CWRU. Dr. Eileen Anderson-Fye was the keynote speaker and participated from Belize via Skype. Anthropology students Carolyn Smith, Kathryn Burke, Gabrielle Cage, Sydney Pierce and Leina Lunasco participated in the panel. Dr. Bridget Haas, Adjunct Assistant Professor of Anthropology, and colleague, Amy Shuman of Ohio State University (OSU), were awarded a grant to hold a workshop for Anthropology Research from the Wenner-Gren Foundation. The workshop titled “Political Asylum and the Politics of Suspicion” was co-sponsored by OSU Center for Folklore Studies and held March 22-23 at the Mershon Center for International Security Studies. The workshop included about a dozen scholars from the U.S. and Europe and explored the impact of the politics of suspicion on political asylum systems. In addition to organizing, Dr. Haas also presented “Adjudicators, Suspicion and the Ambivalent Production of Authoritative Knowledge” at the workshop. Drs. 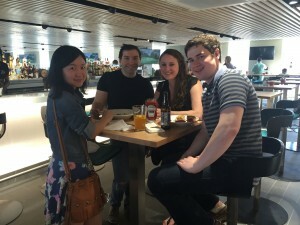 David Mafigiri and Jill Korbin, along with Eddy Walakira and Richard Krugman, received funding from the Doris Duke Foundation to support preparation of a book, Child Abuse and Neglect in Uganda. Dr. Bruce Latimer, Professor of Orthodontics and Adjunct Professor of Anthropology was featured in The Daily for being among the team of researchers who recently described a partial skull discovered in 2008 in Manot Cave located in Israel’s West Galilee. Dr. Latimer was among those invited to examine the fossil skull. The skull provides the earliest physical evidence of when modern man was in the same vicinity of Neanderthals, dating the encounter at some 55,000 years ago. In a previous hypothesis the two species potentially met 45,000 years ago somewhere in Europe. Click here to read the full article. Adjunct Associate Professor, Dr. Isabel Parraga, will be retiring in July. Dr. Parraga received her doctorate in medical anthropology from CWRU in 1992. Her research area of interest is in International Nutrition and she has conducted research in South America and Africa. She has been recognized for her achievements by the U.S. Army, the Ohio Dietetic Association, the Academy of Nutrition and Dietetics, and the American Heart Association. Dr. Parraga received the Carl F. Wittke Award for Outstanding Undergraduate Teaching at CWRU. 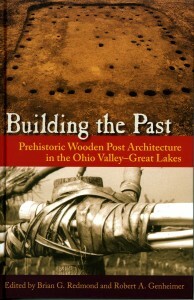 Adjunct Associate Professor, Dr. Brian Redmond, co-edited a new book titled Building the Past: Prehistoric Wooden Post Architecture in the Ohio Valley-Great Lakes published by University Press of Florida. The volume presents new and previously unpublished studies of precontact Native American architecture in the Ohio region. Most of the chapters in this new book are derived from a 2012 symposium sponsored by the Ohio Archaeological Council. Eleven chapters discuss archaeological remnants of wooden post constructions dating from the Late Archaic through Late Prehistoric periods (ca. 4000 to 600 years ago) in Ohio, Kentucky, Indiana, and Ontario. In March Dr. Lihong Shi presented an invited paper titled “Raising A Singleton-Daughter: Transforming Gender Preference in Rural Northeast China” at the New Voices and New Approaches in China Gender Studies Workshop at the Fairbank Center for Chinese Studies at Harvard University. In March, Ariel Cascio successfully defended her dissertation entitled “Biopolitics and Subjectivity: the Case of Autism Spectrum Conditions in Italy.” She also published an article, “Rigid Therapies, Rigid Minds: Italian Professionals’ Perspectives on Autism Interventions,” in Culture, Medicine, and Psychiatry. In April, Ariel presented the paper “Creating Opportunities for Adult Roles for Italians with Autism” at the Society for Psychological Anthropology (SPA) Biennial Meeting held in Boston, MA. In April, Ariel started an assistantship with the Prevention Research Center for Healthy Neighborhoods, CWRU Department of Epidemiology and Biostatistics. Yunzhu Chen recently defended her dissertation prospectus on “Aging and Elderly Support – Comparative Study in Matrilineal and Patrilineal Tibetan Villages in Southwestern China” and will begin her one-year dissertation research in July. This spring, Graduate Discourse organized a three-part student lecture series on biomedical practice and anthropology. The first lecture on February 26th was given by CWRU Anthropology alumnus Andrew Ibrahim, who also holds an MD from the university’s School of Medicine. Andrew’s talk on surgery and health policy included a lively round table discussion between anthropology students and clinicians. The next two lectures included Todd Fennimore’s presentation on interprofessional clinical training and Julia Balacko’s talk on the history of anatomy and the use of cadavers in medical learning. 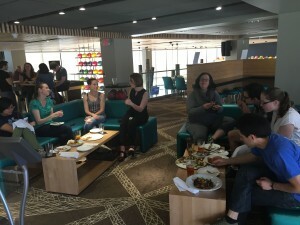 Graduate Discourse members have also organized a recurring peer mentoring group for graduate students to discuss questions regarding research methodologies and theoretical approaches, as well as compiled resources on how and where to publish as a graduate student. Anthropology undergraduate student Paige Hughes was selected as a SOURCE 2015 Summer Research Scholar. Paige’s proposal, mentored by Dr. Almeida, was called “Research at the IRTF: Banana Consumption Awareness and Free Trade in the Cleveland Area.” Paige has been involved in a volunteer internship with InterReligious Task Force on Central America (IRTF), a non-profit organization that focuses on human equality, promoting peace and human rights in Central American countries. IRTF is dedicated to selling fair traded produce, such as coffee, tea, chocolate and other items. The new proposed research will focus on fair traded bananas and ways to replace the dominant banana corporations that are violating human rights in Central American countries. 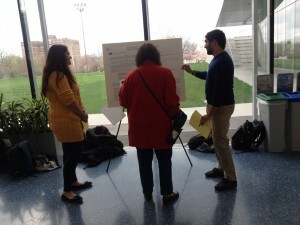 A Capstone Poster Presentation by Alayna Klco called “The Impact of Political Change and Education Reform on Youth Aymara Identity in Bolivia” was the first award winner in Social Sciences during the Spring Intersections Symposium and Poster Session with Research ShowCASE. Alayna, an International Studies major, was mentored by Dr. Katia Almeida. Rising senior, Margaret Kuhl, received the James Dysart Magee Award for an outstanding student in the social and behavioral sciences. Graduating senior, Sarah Kim, plans to attend Loyola University in Chicago for a Dietetic Internship (DI) and Master of Science in Dietetics. The Anthropological Student Association (ASA) was created to bring together undergraduate students in anthropology. ASA is a community centered around discussion and intellectual curiosity in which students have the opportunity to explore educational, cultural, and service opportunities in Cleveland, and share their passion for anthropology with the campus community. ASA and Lamdba Alpha hosted the first ever silent art sale, (he)Art For West Africa, to benefit victims of the Ebola epidemic. The proceeds went to the Partners in Health (PIH) efforts to help mitigate some of the Ebola ramifications. Madelynne Dudas, Tessa Greene, Elsa Imbimbo, Lawrence Monocello, Christine Oak, and Kristen Klemmer were elected as members of Phi Beta Kappa by the Alpha of Ohio Chapter at CWRU. Nedda Dastmalchi (CWRU MA 2011) is in her first year of medical school at the Edward Via College of Osteopathic Medicine in Blacksburg, Virginia. Theresa D’Ettorre (CWRU BA 2015) is a mid-year graduate with a BA in Medical Anthropology and Evolutionary Biology who is volunteering with AmeriCorps in Denver, Colorado through City Year. City Year is an education-focused, nonprofit organization that partners with public schools to help keep students in school and on track to graduate. Teams of AmeriCorps members commit to a year of full-time service, supporting students by focusing on attendance, behavior, and course performance. Along with Theresa’s daily service, which includes in-class tutoring, mentoring, and after school learning, she runs a STEM program and is working to bring a free mobile health clinic to the students and families of Northwest Denver. Theresa plans to pursue a career in medicine after her time with AmeriCorps, continuing work in under-resourced communities. Andrea Fischione (CWRU MA 2011) is in her second year of medical school at Lake Erie College of Osteopathic Medicine in Erie, Pennsylvania. Prior to starting medical school she worked for two years as a post-baccalaureate fellow at the National Cancer Institute. Steven Folmar (CWRU PhD 1985) is an Associate Professor and Associate Chair of the Department of Cultural/Applied Anthropology at Wake Forest University. For the past decade he has been focusing on issues of identity and social justice for the Dalits of Nepal and the impact of this social inequality on mental health. In 2012, he was awarded a three-year National Science Foundation (NSF) grant for a research project entitled “Oppression and Mental Health in Nepal” (OMH-Nepal). 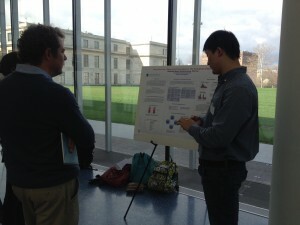 In 2014, he learned from his Program Officer at NSF that his project was pending review. It is one of fifty jackets singled out and requested by the House of Representatives Committee on Science, Space, and Technology. He was interviewed for an article in the News section of Science in October entitled “Battle between NSF and House Science Committee Escalates: How Did It Get This Bad?” and featured in the blogs section of PLOS in a blog entitled “Oppression, Mental Health, and the House Science Committee.” Folmar recently presented findings from OMH-Nepal in a presentation entitled “Caste and Mental Health in Nepal” at the 2015 Society for Applied Anthropology (SfAA) Annual Meeting in Pittsburgh. Joseph Galanek (CWRU PhD 2012) is a research associate at the Begun Center for Violence Prevention Research & Education at Case Western Reserve University. He has reported in the Viewpoints section of The Crime Report on issues around mentally ill prison inmates. The reports range from abuse and insights on how to effectively provide mental health treatment in prisons, as seen in “We Can End the Abuse of Mentally Ill Inmates” to the detrimental effects of solitary confinement as seen in his report on “Why Do We Place Our Most Vulnerable Prisoners in Solitary?” He was part of a panel discussion on “Safety Forces and the Mentally Ill” on The Sound of Ideas, 90.3 WCPN ideastream, discussing whether police are equipped to deal with the mentally ill and if more training is needed. While attending the Inaugural Meeting of The International Society for Evolution, Medicine, and Public Health, Dr. Cynthia Beall met two CWRU alumnus, Mandy Azar, currently a physician, and Theodore Smith, currently a graduate student at Ohio State University. Jodi Lyons (CWRU MA 2013) is currently working at MetroHealth Hospital as a Clinical Research Coordinator in the OBGYN department. Her primary study is looking at Hepatitis C in pregnant women and what increases/influences the vertical transmission rate of passing the virus to their infants. She screens, recruits, and oversees the enrolled women during their pregnancy and continues to follow them for two years after their pregnancy has ended. She also helps with four other OB related studies that her co-workers are primary coordinators on as well. She plans to return to school part-time in the fall to get her MBA. Sarah Rubin (CWRU PhD 2014) presented a paper at the 2015 Society for Psychological Anthropology Biennial Meeting in the “Culture and economic adversity: contemporary psychocultural engagements” panel entitled ““I’m sending my child so I can work for my child”: mother love in a South African township.” Sarah was hired as a full time Lecturer beginning 2015 July for the Department of Social Medicine at the new Cleveland campus of the Ohio University Heritage College of Osteopathic Medicine. Aaron Sepulveda (CWRU MA 2014) is working until mid-May on a CWRU public health research project studying the impact of exercise interventions on overweight and obese adolescents. He will then be going to Togo to work for the Peace Corps Community Health and Prevention Program.